Jobu weighs in on the unbearable roster tenure of Ben Francisco. I understand why Ben Francisco made the Yankees’ roster. I really do. No, he’s not that good at baseball, but as a right-handed bench option, he was a good one. Of course, anyone who gets released a week before Spring Training ends probably isn’t an ideal candidate for a major league roster, but the Yankees are dealing with a lot of injuries and they need to tread water with some scrap heapers while everyone heals. That being said, and despite the fact that we’re only a few weeks into the season, there’s probably no reason for Francisco to be on the roster anymore. Today, we start the watch. Keep in mind that the Yankees cut Juan Rivera to keep Francisco. The two were essentially vying for the same spot, Rivera was hitting the ball, Francisco got released by the Indians… Next thing you know, Francisco’s on the team and Rivera’s going home. Would Rivera have been any better? It’s hard to say yes or no on that, but Francisco is probably the better option in the field at this point (not that that’s saying much). So, like i said, I get why Ben made the team. What has he done so far this season? Serving mostly as the designated hitter against lefties (oh the irony), Francisco has hit .103/.188/.103 with no homers and no RBI. That’s right. The primary designated hitter against left-handed pitchers, who was just seen the other night batting fifth against David Price of the Rays and then batting second against Mark Buehrle last night, is hitting .103 with no extra base hits. How long can this go on? The best thing Ben has done all season. Click to watch on MLB if you don’t see it. I know what you’re thinking… But Jobu, there’s no one else that could possibly take that roster spot from “Gentle” Ben Francisco. Well, you’d be wrong and possibly as dumb as Girardi and Co. There are plenty of options in AAA right now that couldn’t possibly do worse, and could help the team a lot more in other ways as well. 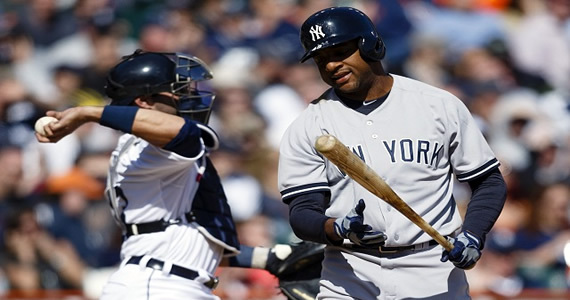 If the Yankees want a real outfielder, there’s always Zoilo Almonte. Almonte almost made the team straight from AA this spring (the minor league level, not the rehab program). So far in AAA, he’s hitting .263/..411/.404 with 10 RBI and15 BBs in 17 games. Now I know he could do better than Ben Francisco for sure. How about another Indians castoff, Thomas Neal? Guy hit over .300 in AA last year, and so far in AAA this year, he’s hitting .328/.373/.410 with a couple of homers. Either one of those guys could easily do what Francisco does… right? Anywho, I’m not sure what the Yankees will end up doing here. Odds are Francisco will stick around until Curtis Granderson comes back (probably longer if Girardi has any say), but I officially want him gone. Start the watch.